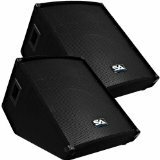 Pair of 15" Stage or Floor Monitors - Model # - SA-15M (Set of 2), Woofer - 15" 2 way crossover with a 50 ounce magnet, 2.5" Kapton voice coil , 250 Watts RMS - 500 Watts Peak , Wired at 8 ohms , 40Hz - 20KHz, Sensitivity: 97 db. , Piezo Tweeter - 4x10 , 5/8" plywood front panel , Black carpet with black metal corners, Recessed handles , Full Metal Grill , Input terminal with two 1/4" inputs, Dual ports, 23" tall 18" wide 17" deep, Weight: 38 lbs per monitor, These monitors are brand new., One year warranty. This listing is for a pair of these monitors. You will receive two monitors, pictured and described above. Each monitor has the specs above. These monitors are great for vocals, PA systems, small DJ gigs, weddings, churches, and sound monitors. These can be used on any setup for full band or drum monitors. Woofer - 15" 2 way crossover w/ a 50 oz. magnet & 2.5" voice coil. 250 Watts RMS -500 Peak.